How come Microsoft is so popular? Tech Panel During October- November 2008, Freeform Dynamics ran a survey in association with The Register. Some 1,125 people, from organisations large and small based in the UK, United States and a wide range of other countries took the time to let us know how IT systems are being used in their businesses. This article gives a brief summary of developments associated with storage solutions. As can be seen in the figure below the catch all “General Infrastructure Optimisation” is the leading initiative currently being undertaken by organisations as they respond to mounting business challenges and the global economic climate. Many initiatives highlighted in the barometer survey have the potential to impact storage environments, some directly but many others via indirect consequences. 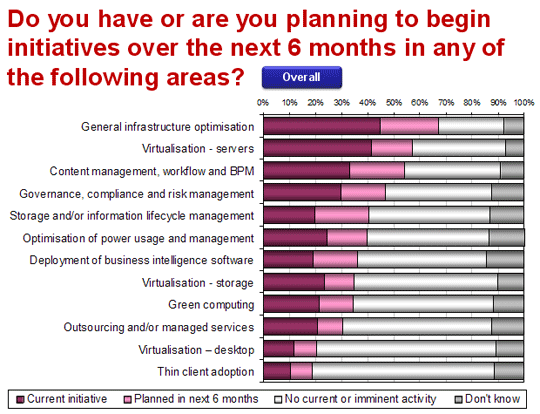 Clearly, initiatives such as “General Infrastructure Optimisation”, “Storage and Information lifecycle management” and “”Virtualisation – Storage” affect storage deployment, but a number of other initiatives also have the potential to have an indirect impact on storage systems, some significantly. These include power optimisation projects and desktop virtualisation initiatives. Unsurprising then, that we can see from figure 1, “Storage and Information lifecycle management” initiatives are now active are planned in around 40 per cent of organisations. It is now becoming recognised by many organisations that spending on storage systems and their ongoing management is today one of, if not the, fastest growing areas of the IT budget, even in these austere times. With the increasing demand for long term information access, external pressures governing the retention and recovery of business information and a growing awareness of the cost of energy needed to run the IT infrastructure, including storage, it is clear that attention is turning to storage management. However, we know that storage system deployment can be a major challenge, especially if a new architectural approach is being considered. Storage may, of itself, be seen as quite mundane when compared to more exciting areas of IT. However, its significance due to being where the data resides means that there is zero room for error when it comes to replacement or migration of storage systems. It is interesting to speculate on whether the recognition of Microsoft as a major player in storage can be attributed to a broadening of what is considered 'storage', or if it is a consequence of either specific products that the company now has in this area, perhaps data movement or file systems, or is it down to an increased vocalisation of the storage capabilities it embodies and enables in its core offerings? Overall, I am not surprised to see Microsoft gaining such high recognition in SMBs (figure 3), but I am surprised that large enterprises have even higher enthusiasm, especially as most such organisations employ specialist storage professionals who have grown up with the "traditional” storage vendors by their side.